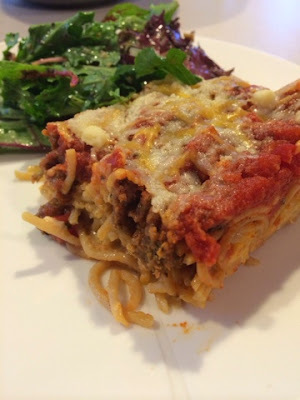 In our house, leftover meatloaf always becomes the meat in the spaghetti meat sauce for night two. And last night it happened again, but in a more spaghetti bake casserole type of way. It was delicious! Drain spaghetti; place in large bowl. Add egg, 1 cup mozzarella and Parmesan; toss to coat. Place in 8-inch baking dish sprayed with cooking spray; top with meat, spaghetti sauce and remaining mozzarella. Dash with more Parm. Bake 15 min. or until heated through. Let stand 5 min. before cutting to serve. I don't really think my salad findings deserve their own post, but because we do have a simple green salad just about every night with dinner, I've found a few simple ways to keep it interesting. I've been going thru my pantry to find anything other than croutons for that added crunch. I don't even like croutons that much -- unless they're on some super gourmet salad from some super gourmet restaurant. If anyone has a lead on good croutons you can buy in a store that don't taste like cardboard, I'd love to know... So far, my favorite salad toppings include chia seeds (for the health nut), french fried onions (for the anti-health nut), slivered almonds or nuts of any kind, and my new favorite: boxed seasoned stuffing mix! And even though the stuffing mix is kind of like a bunch of smaller cheap croutons that I should hate, it totally works because they're tiny croutons that give you a crunch without that big bite of cardboard. And that's my salad rant. The end. I'm going to have to do a post on home made croutons. I totally agree with you, Missy. Store bought taste like cardboard. Home made is the way to go! And I'm a pro at it so I'll post next month. I have never made a meatloaf! I also need a recipe!